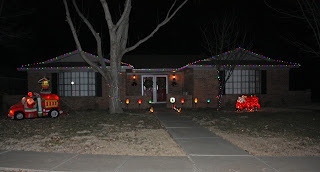 Here are some pictures of our house decorations this year! 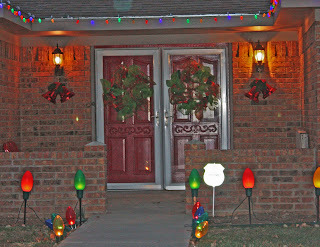 We opted for LED lights instead of our regular multi-colored ones. So almost all the strands are plugged into ONE outlet! They're awesome! I LOVE Christmas decorations and when I say love, I truly mean it! Even though decorations are not the reason to celebrate this time of year, I still love to enjoy them! 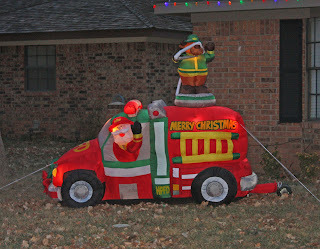 Mom & Dad got us this firetruck inflatable this year, isn't it cute! Santa waves and the reindeer on top spins around! 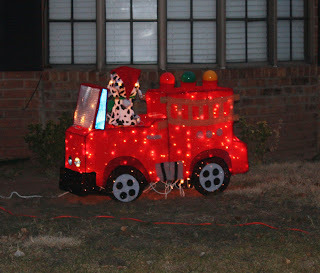 This is our dalmation driving the fire truck. Let's just say I paid a LOT of money for this thing, and it's a piece of junk. I'm pretty sure it's only meant to use for one year. Just to stay together we had to rig it up with floral wire! So pathetic! I know you can't see the wreaths real well, but they are so cute! Mom found a blog showing how to make them, so she made one for her fireplace and after seeing it, I knew that's what I needed on my front doors! TA-DA!! There's also light's down the side of the house and the fence, and also in the rest of the tree's but I couldn't get a decent picture! So, just imagine it in your head! Here's our Christmas card for 2009. I think they turned out pretty well! I hope y'all enjoyed looking at all our decorations for Christmas this year! But never forget, that Jesus is the reason for the season! The decorations are outstanding. The neighbors will enjoy them too. 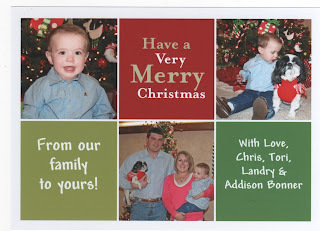 The Christmas card is great and my friends have enjoyed it too. I am so glad you like to decorate and celebrate the birth of Jesus that we love to give thanks to for our many blessings. I am proud of you.Love you. Love the decorations and card! THe decorations look really cute! I'm jealous because we can't reach our roof to put them on the house so we have to settle for the tree. Your firetrucks looks great. We got the card and it's super cute too. Thanks! Be looking in your mail for ours.